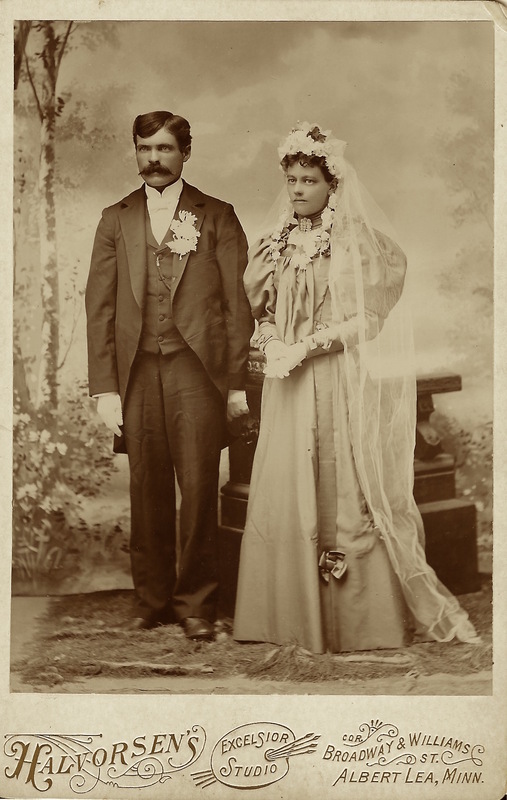 This cabinet card features a well dressed handsome groom and his pretty pensive bride. The bride and groom are bedecked with flowers and are wearing white gloves and serious expressions. The reverse of the cabinet card has a penciled inscription stating “Mrs. Torborg Halvorsen”. This creates some interesting speculation considering that the photographers name is also Halvorsen. Is this the photographers wedding photo? Is the bride or groom in this image a child of the photographer? Preliminary research failed to answer these questions. However, it was learned that there was a photographer named J. R. Halvorsen who operated in Albert Lea, Minnesota between 1886 and 1887. He is certainly the photographer of this image but the exact identity of the subjects in this portrait remain unknown. It is important to note that Halvorsen, a Norwegian name, was not an uncommon name in Minnesota. Minnesota had many residents of Norwegian origin or roots from Norway. 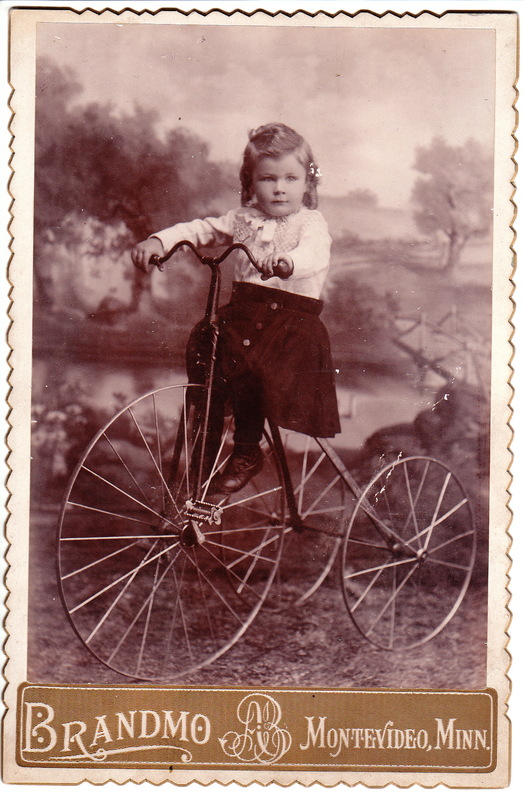 A little girl sits high atop a giant tricycle in this cabinet card photograph by Andreas Brandmo. Brandmo’s studio was located in Montevideo, Minnesota. The little girl won’t be able to ride very far on her monster bike. Unfortunately her feet do not seem to reach the bike’s pedals. She also doesn’t look particularly comfortable on her perch, as she poses for the photographer. The 1900 United States census reveals that Brandmo was born in Norway in 1855. He came to the United States in 1882 and married his wife Martha in 1885. Apparently, Brandmo and his wife were producing children at a rapid pace. After 15 years of marriage, the couple had eight children spanning between three and twelve years of age. The census also indicated that Brandmo’s niece, Lucy Husaby, worked as a photographer in his studio. The family lived in Appleton, Minnesota. 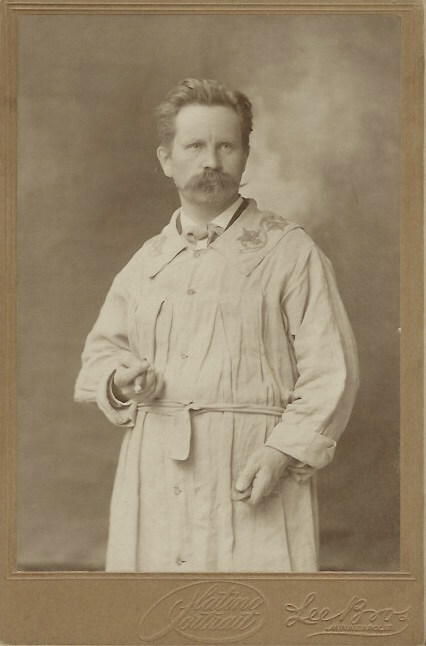 Research found that Brandmo operated his Montevideo studio between 1886 and 1896. It was also reported that he ran a gallery in Appleton in 1898. At some point he had a partner and their studio was named Brandmo & Lodgaard. The 1910 census reveals that Andreas Brandmo changed his name to Andrew Brandmo. Perhaps when he realized he had eight children and a wife depending on him, he changed his name and entered the Federal Witness Protection Program. More likely though, he probably Americanized his name for business purposes. The 1910 census also notes that his son Alf, had joined him in the business and was working as a photographer.